I've lived in Los Angeles long enough to have observed that there are only three things people will wait in a really, really long line for. The list includes art exhibits that guarantee at least one epic Instagram opportunity, a new high-profile restaurant or dessert shop (hey, Milk Bar)—and sneakers. If you're surprised by the last one, I highly recommend you research the alive and very much thriving sneakerhead culture; you'll be hooked. And while I may not be participating in bidding wars, or spending my Saturday mornings on Fairfax itching to get my hands on the latest drop, I do consider myself a sneaker lover. My problem lies in my hesitation to wear sportier pairs outside of the gym or the farmer's market; I just don't know if I'm pulling them off. 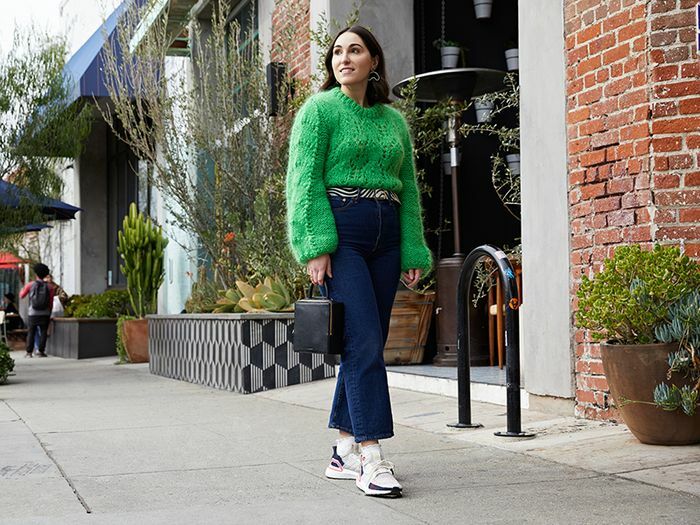 However, it just so happens that I work with some of the most fashionable women in the city (there may be some bias, but largely true), so I asked one of my co-workers, Anna LaPlaca, to share her sneaker styling tips. She's kind of a pro at mixing sportier pieces into her polished looks, and boy, did she not disappoint. I may not throw away my heels anytime soon, but they're going to be relegated to the back of my closet after seeing these spring-perfect looks Anna styled with her new Adidas Ultraboost 19 sneakers. Don't be surprised if you do the same. "I'm almost always game to try whatever the fashion world is buzzing about at the moment," Anna says of her style choices. I'm more of a wait-to-see-if-this-sticks kind of girl myself, so I admire her willingness to jump on trends immediately. Anna's outfits tend to stray from the cookie cutter fast-fashion looks, to which she credits her knack for vintage shopping. Being able to mix the old with the new is a styling skill that'll make your outfits feel more you. Her Ultraboosts make an otherwise fancy-feeling slip dress more casual and more practical for a weekend walk around Echo Park Lake (a spot near her East L.A. home that she says is a must for a picnic with friends). True to her affinity for trends, Anna adds a bright bucket bag and doubled up on pearl hair clips to offer her own fresh spin on the outfit. I love that Anna chose to style her comfy kicks with a pair of more tailored jeans for one of her looks, something I always find to be a bit of a challenge. She says the key here is selecting a casual top, like this oversize sweater, to balance out the more structured jean. This seemingly simple look is anything but boring for two reasons: the fun zebra-print (which, by the way, might just be the new leopard print) belt and the color-blocking of the shoes, which Anna says makes everything a thousand times more interesting. I agree—and would also like a link to these cute cherry socks at her earliest convenience. On days when meetings take her outside of the office, Anna likes to take her already fun work outfits up a notch or two. Exhibit A: this dreamy pastel look. "This pantsuit is a strong silhouette that hits the right note for a press meeting, but the bright color and tie-dye T-shirt underneath ensure it's still 'fashion,'" she tells me. "I opted for the sneakers to dress down the suit a tad, and I love how they make for a cool contrast with something that's traditionally more professional," she notes. The hue of the suit also draws out the pink details in the sneaker, making for a fun coordinating moment. My favorite spring trends are tie-dye, bucket hats, and any other motifs of surf/skate culture that constitute a very laid-back approach to dressing. I'm also really into all the hair clips and barrettes that remind me of being a kid in the '90s. My go-to sources for fashion inspiration are Instagram for obvious reasons, classic movies from the '60s and '70s, and fashion editorial spreads for more out-of-the-box styling ideas. My favorite part about my Adidas Ultraboost 19 sneakers are the fun pops of color that make them stand out from all my other sneakers. The best part about being a fashion editor is playing with clothes! I like to think I started playing dress-up early on in life and never really stopped. I'm a sneaker lover because they allow me to breeze through my day über-confidently. Comfort = confidence, always. My current favorite color is green. Neon had a moment, but I think the color will continue to feel fresh for a while with the emergence of softer sage and pistachio shades. I never leave the house without sunglasses. I have a zillion pairs in my rotation.